I have a favour to ask you and that is if you could please help me win a contest for a video award that will be hosted by Japan in Nagoya. The main purpose of the video contest is to show " interesting " things and places about Japan/Japanese culture in the country that you live in. 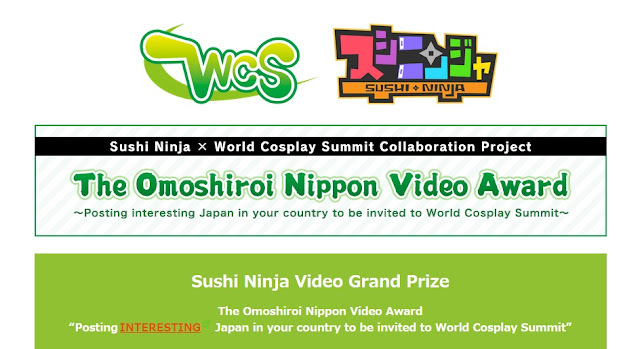 Two pairs of lucky winners will be chosen and invited to go to Nagoya, Japan to attend the World Cosplay Summit event that will be held there. I created this video entirely myself with some help from a friend and I worked very hard on it from going to the places to shoot the video, taking photos and editing the video. I really hope I can win and I will need some help from you. Please watch my video and share it on any social media sites such as facebook, twitter, tumblr, google + and etc to get more views. It would be GREATLY appreciated if you could do that for me! =) If I win and actually get to go to Japan, I will buy something there to host a giveaway on my blog when I come back as a reward of my gratitude and appreciation!